The Ionospheric Connection Explorer (ICON) is a planned satellite designed to investigate changes in the Earth's ionosphere. ICON will study the interaction between Earth's weather systems and space weather driven by the Sun, and how this interaction drives turbulence in the upper atmosphere. It is hoped that a better understanding of this dynamic will mitigate its effects on communications, GPS signals, and technology in general. It is part of NASA's Explorers program and will be operated by UC Berkeley's Space Sciences Laboratory. On 12 April 2013, NASA announced that ICON, along with Global-scale Observations of the Limb and Disk (GOLD), had been selected for development with the cost capped at US$200 million, excluding launch costs. The principal investigator of ICON is Thomas Immel at the University of California, Berkeley. ICON was originally scheduled to launch in December 2017 and has been repeatedly delayed because of problems with its Pegasus XL rocket. Most recently, it was due to launch on 26 October 2018 but the launch was postponed to 7 November 2018. Once launched, ICON will perform a two-year mission to observe conditions in both the thermosphere and ionosphere. ICON will be equipped with four instruments: a Michelson interferometer, built by the United States Naval Research Laboratory, will measure the winds and temperatures in the thermosphere; an ion drift meter, built by UT Dallas, will measure the motion of charged particles in the ionosphere; and two ultraviolet imagers built at UC Berkeley will observe the airglow layers in the upper atmosphere in order to determine both ionospheric and thermospheric density and composition. Many low-Earth orbiting satellites, including the International Space Station, fly through the ionosphere and can be affected by its changing electric and magnetic fields. The ionosphere also acts as a conduit for many communications signals, such as radio waves and the signals that make GPS systems work. The ionosphere is where space weather manifests, creating unpredicted conditions such as electric currents that can cause electrical charging of satellites, changing density that can affect satellite orbits, and shifting magnetic fields that can induce current in power systems, causing strain, disrupt communications and navigation or even blackouts. Improved understanding of this environment can help predict such events and improve satellite design. Today's launch attempt has been scrubbed. 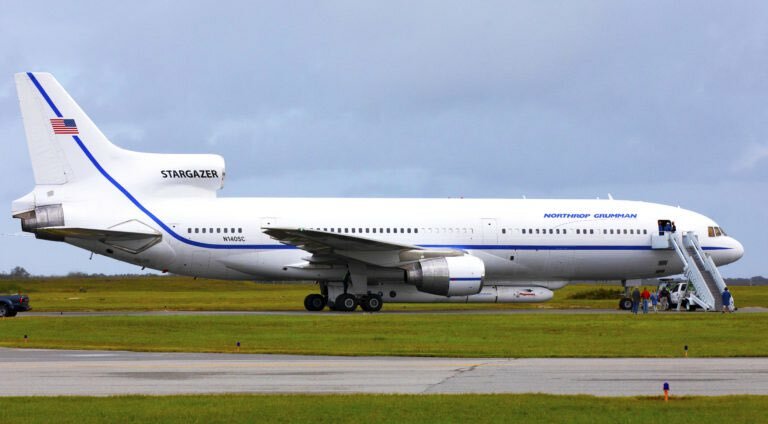 Stargazer is returning to Cape Canaveral Air Force Station with the Pegasus rocket. No word yet on the reason for the mission abort. The Pegasus rocket's L-1011 carrier aircraft has landed back at the Skid Strip at Cape Canaveral Air Force Station with the ICON satellite on-board after this morning's scrub. Ground crews will soon begin investigating the problem encountered shortly after the L-1011 departed Cape Canaveral. The issue observed this morning is believed to be related to electrical problems noted during the Pegasus rocket's cross-country ferry flight to Cape Canaveral last month from Vandenberg Air Force Base, California. Managers ordered an extensive data review, replaced hardware on the rocket, and conducted a captive carry test flight Oct. 28 to assess the electrical problem with a GPS receiver on the Pegasus rocket. Officials met Tuesday for a launch readiness review and approved plans for this morning's launch attempt, with a drop of the Pegasus rocket timed for 3:05 a.m. EST (0805 GMT), but decided any recurrence of the electrical issue would prompt an automatic abort of the mission, as apparently happened soon after the L-1011's departure from Florida toward the Pegasus drop box over the Atlantic Ocean east of Daytona Beach. NASA says a backup launch opportunity is available Thursday at the same time, assuming officials can resolve this morning's problem and clear the rocket for flight. Is this the first Pegasus launch since Orbital-ATK became Northrop-Grumman? What does the Stargazer look like these days? NASA and Northrop Grumman are not expected to attempt a launch of the Pegasus rocket Thursday, as officials continue evaluating pesky problems plaguing the launcher after an aborted try to send NASA's ICON ionospheric probe into orbit early this morning. A new launch date has not been determined, but the availability of the Air Force's Eastern Range to support the mission is in question the next few days. A SpaceX Falcon 9 rocket is set for a static fire attempt at the Kennedy Space Center as soon as Sunday, followed by a launch no earlier than Nov. 15 carrying a commercial communications satellite. That mission, coupled with other maintenance activity on the range, could be problematic for NASA and Northrop Grumman managers to find an opening for a launch attempt in the coming days, assuming the Pegasus is cleared for flight.